Instead it gets cropped, and you see what's captured in the attached image. Have I hit some cap on the size of a given post? GRRR... the top post is still getting cropped at the end. It looks fine when you preview, but a significant chunk at the end is getting lopped off. Until a new site software update that fixes the post-size-limit is installed later this year, the Moderators suggested a work around of splitting the single large post into two separate ones. PS: Using a bitly link because when this list is posted on 911uk.com, the actual URL to that article causes the entire post to be rendered 'blank'. I'm assuming there's some bug in the rendering code when parsing that URL. 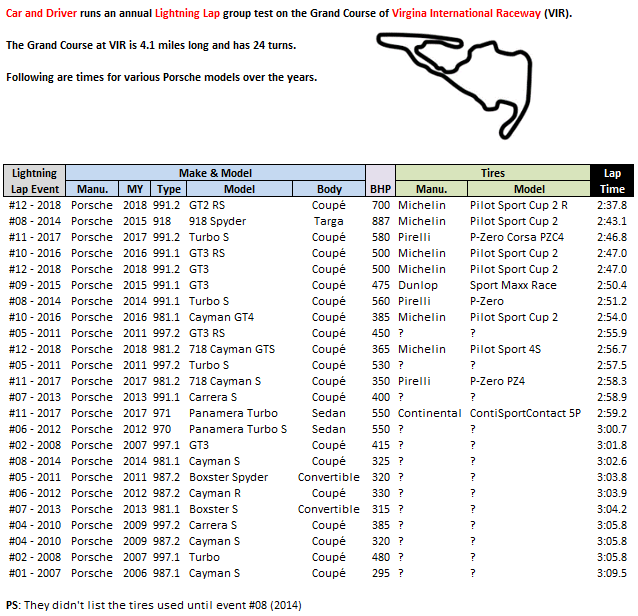 As regards comparative lap times, both Motor Trend and Car and Driver have accumulated a large number of lap times at Laguna Seca and VIR respectively. 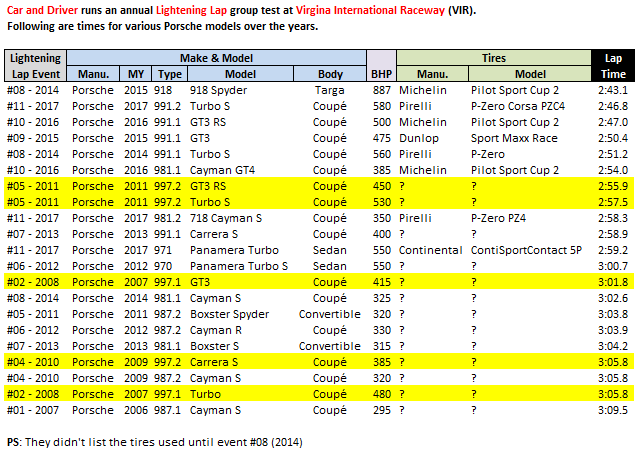 The attached tables show how the 997 models stack up against other Porsche models. There's a classic Best Motoring International video review of the 997.1 Carrera and Carrera S. It's one that has come, but then gone from YouTube. Looking at those lap-time tables the most interesting thing for me is just how impressive the 991.1 Carrera S and 981.1S times are. Here are the historical laptimes for Porsches (including the 997 models) over the years. Ring times from Auto Motor und Sport (AMuS), with either Horst von Saurma or Christian Gebhardt at the helm. Here are their times for various Porsches over the years (with the 997 models highlighted in grey). Added the latest results (including a sprinkling of laptimes for modern 'affordable' cars) to the Laguna Seca table. The 997 times are highlighted in grey.